We can use this to insert a good content to entice customers/prospects to contact Albino Industrial Belting! Power transmission is our business, and you have come to the right place. 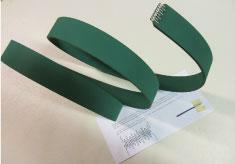 Al Bino is your go-to source for unusual or specialty flat drive belt and V-Belt applications. While we enjoy belting the old machines of a by-gone era, it is important to know that today’s “high speed” belting can apply to both the old and newer machines. Modern belting is very strong, flexible, smooth, and vibration free with no seam or splice. It can be used on pulley diameters as small as 3/16”. These belts can breath new life into a trusted machine of the past. We replace belts for the Delta wood/metal saw, and others that are hard to find. We also provide belts for diverse applications such as the Ikegai lathe, Arter surface grinder, Wheelabrator blaster, Klinker farm blower, Bullard VTL, Sheeter, and others. 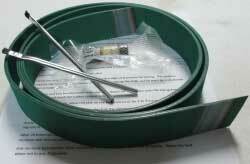 Check out a lathe belt replacement glue kit video by one of our customers. It is frustrating to order a belt and not have it fit. Please take time to read the appropriate section of our "How to measure for your machine belt". “Measure twice, cut once” works for us, and measuring twice with utmost care will give you the assurance your belt will arrive perfectly sized for your machine. 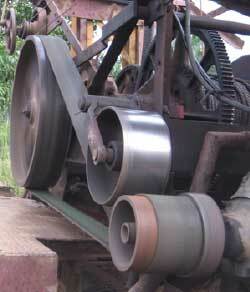 Does your project require an antique machine flatbelt replacement? Find it here! Machines without tension adjustment, and/or to retain antiquity for shows/museum may require leather. Other machines may do well with nitrile or various light to heavy duty ply construction with friction surfaces and covers, as required. 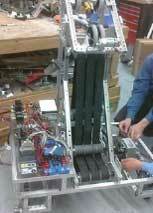 We have provided flat belts for robotics to swing seats. We carry light, medium, heavy, and extra heavy leather in friction one side (single), or friction both sides (double). Light leather: Applicable for minimum pulley diameters of 1.5” to 6.0” in thicknesses of 1/8” and 1/4”. Medium leather: Applicable for minimum pulley diameters of 3.0” to 8.0” in thicknesses of 5/32” and 5/16”. Heavy leather: Applicable for minimum pulley diameters of 5.0” and 12.0” in thicknesses of 3/16” and 3/8”. Extra heavy leather: Applicable for minimum pulley diameters of 7.0” and 16.0” in thicknesses of 1/4” and 1/2”. We offer a finished laced or glued endless belt. Pricing is based on width/thickness of leather, weight of the finished belt, plus shipping cost to the customer's zip code. Because it is THE PLACE to obtain a flat drive belt any size! We like what we do, and we want you to experience the products, efficiencies, and insights we provide. If we cannot help you outright, we have a network of consultants who are at the top of their field. In this business every detail is important to the whole, and that fact is highly regarded here. We are ever mindful of follow through and follow up, and giving to the customer that which we would expect and deserve as a customer ourselves.